Writers, it’s time to sharpen your pencils, refill your fountain pens, or warm up those keyboards. Join with fellow writers around the world for our fifth annual write-a-thon, now open for registration. It’s like a walk-a-thon, except for writing! Participants can be pledged by the word, chapter, or story. Finish that novel you’ve been working on. Write and submit new short stories. Try your hand at writing speculative poetry. The goal is up to you. The six-week event mirrors the Clarion Writers’ Workshop, running from June 22nd to August 2nd. Write and/or pledge to show your support for the latest batch of students, chosen from among hundreds of applicants, as they learn from some of the best writers and editors in our field. 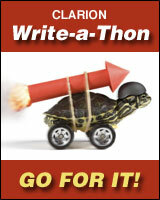 The write-a-thon is open to everyone, whether you’re just getting started or you’re a seasoned pro. Previous attendance of Clarion is not required. What does the money raised from donations and pledge go to? 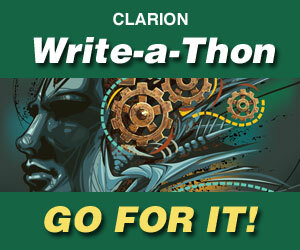 All funds raised during the write-a-thon go to the Clarion Foundation, whose express purpose is to support the Clarion Writers’ Workshop, financially and strategically, in providing a high quality educational experience for aspiring writers. We’re giving away prizes to our top Write-a-thon earners. The top five earners will receive critiques from some of Clarion’s most successful alumni and friends; people like Karen Joy Fowler, Ted Chiang and Delia Sherman. Every writer who raises $250 or more will receive a critique from a Clarion alumni of our choice. Writers: Sign up, fill out your profile, and enter your goals. Then use the handy buttons to share your Write-a-thon profile with your social networks. Sponsors: Browse the list of writers, select the person you would like to support, and click the Donate button. Registration is optional for donors, but required for pledges. Registration allows us to properly credit your donation to the individual writer, to generate thank you and tax acknowledgement letters automatically rather than manually, and to run the Write-a-Thon without hiring employees. We thank you from the bottom of our hearts. Reblogged this on KEYAN BOWES.